In case you’re wondering, I have no clue if T-Dux is actually supposed to mean anything. Probably not. So, let’s move on to the notable things about the ol’ Dux here. First, is the physical size of this tank. It appears to be pretty close in size to the Aro tank with which it shares a lot of design ques. The T-Dux is slightly slimmer. 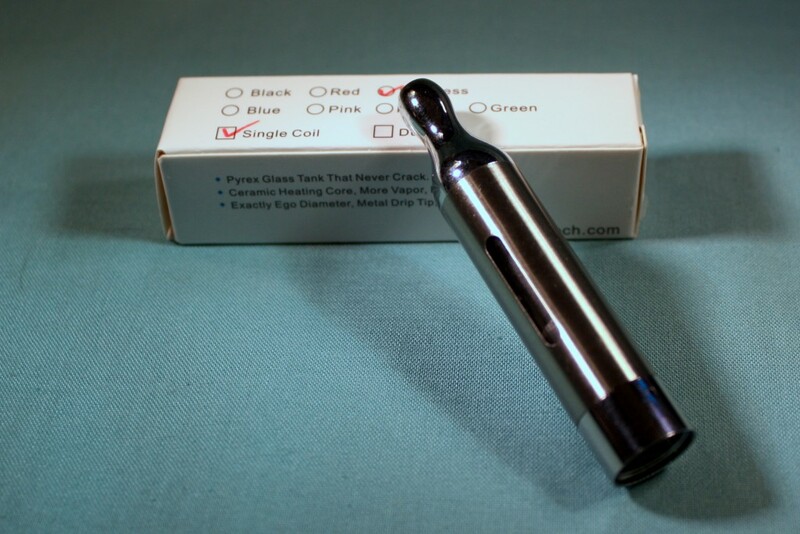 It’s specifically designed to be the same diameter as most eGo style e-cigarettes on the market. That makes this particular tank look nicely finished on an eGo. Of course with a slimmer design, you do get a little less e-liquid holding capacity. A small price to pay for such great style I suppose. The viewing windows are also smaller on this model, but the inside sleeve is still made of Pyrex, so no worries about cracking here. But, the main difference between the two tanks is the new coil design. 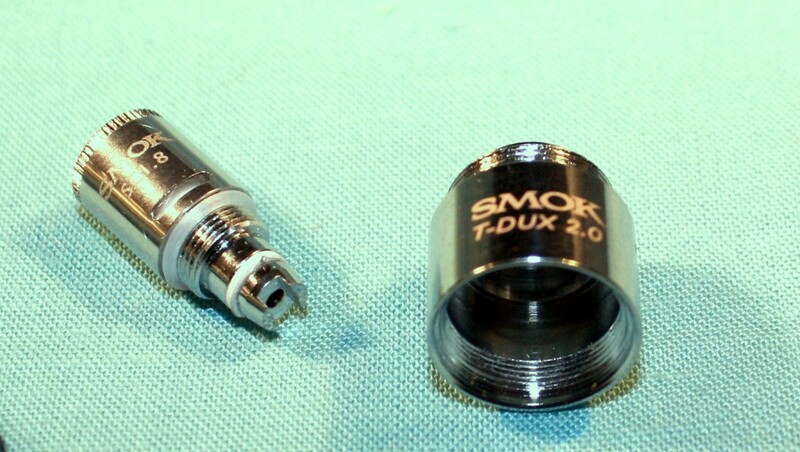 Unlike most other Smok bottom coilers that use the same replacement heads, T-Dux marches to its own beat. Its head lacks a stem and instead sports a gasket at the top of the coil area. The outside of the head fits around the stem inside the tank with the gasket serving the purpose of creating the seal. Instead of two small wicks poking out the sides of the head, there are two slots toward the bottom. Essentially, the outside of the head looks like a little can. Inside that can is where things start to get interesting. For those of you old-timers, the following might sound familiar. The heating coil is placed inside a ceramic cup with wick sticking out either end of the coil. You might recognize that as the way the old CE2 clearomizers used to do business. There are a couple of differences from the old-school clearos. First, the ceramic cup is about twice as high. Second, rather than the wicks protruding into the tank as strings, they are flattened out and sit behind the slots in the metal head enclosure. This design serves to prevent flooding. Well, most of the time anyway. One of the Duxes I bought had a pretty significant leaking problem. I was able to fidget with the wicks to get them working again. Hopefully that was just an isolated manufacturing flaw and not a harbinger of the product itself. The bottom half of the heads are pretty much like you’d expect. They screw into the removable base of the clearomizer for quick and easy replacement. The thing about the CE2s was that when they worked, they were actually a fantastic vaping experience. the problem was those wick designs were terribly inefficient, so you were just as likely to get a dry hit as you were to get a good one. Forget about running higher wattages with CE2s, that was a guaranteed trip to burnsville. Turns out, if you change up the way the wicks are spread out and move them to the bottom of the tank, you end up with something nice. Save for the defective head I had, there wasn’t much problems in the way of flooding. Once the wicks were properly saturated, at no point did they run dry. The end result was a really decent amount of vapor coming from this little tank. Flavor was great too. When CE2s weren’t all polluted by burnt taste, they produced an excellent flavor profile. The T-Dux gives you that flavor profile without the whole forest fire thing. In fact, I had inadvertently left my MVP cranked up all the way to 11 watts and used the T-Dux on that setting for about an hour. I never noticed a burnt taste, just that the vapor was warmer than normal. Eventually I figured it out with the tank being no worse for the wear. Usually when I don’t pay attention, bad things happen. The T-Dux delivers on the promise of a bottom-coil CE2 that we have been waiting for the better part of two years now. 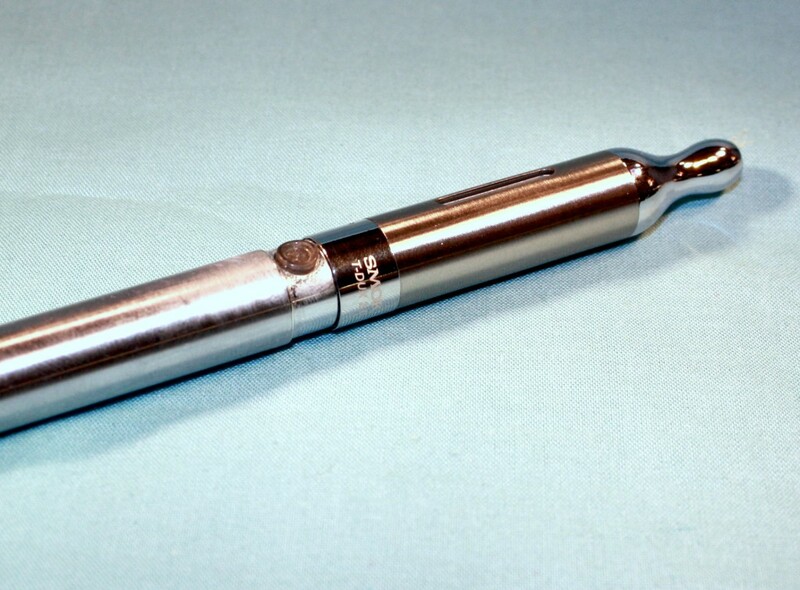 For those not familiar, the early bottom coil CE tanks were absolutely terrible. Slimmer than its cousin, the Aro tank, the T-Dux fits perfectly with eGo devices and delivers on an old promise. It boasts a CE2-like heating assembly on the bottom of the tank that doesn’t gurgle and is easy to fill. The result is a small tank that produces a nice amount of great-tasting vapor. You can check ’em out for yourself at MadVapes.